The company was founded by Walter H. Maudslay, great grandson of the eminent engineer Henry Maudslay to make marine internal combustion engines. He was joined by his sons Cyril and Reginald Walter, but the latter soon left to found the Standard Motor Company. The engines did not sell very well and in 1902 they made their first engine intended for a car which was fitted to chain drive chassis. The three cylinder engine, designed by Alexander Craig was an advanced unit with a single overhead camshaft and pressure lubrication. It was followed in 1903 by a six cylinder version, possibly the first overhead camshaft six to go into production. 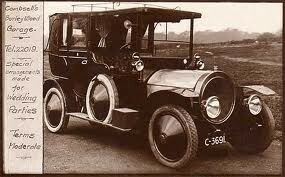 For 1904 a range of cars was on offer including one with a 9.6 litre version of the six cylinder engine. The cars were among the most expensive on the British market. Despite the advent of peace in 1918, private car building was not resumed, apart from a solitary example of an advanced sports car shown at the 1923 London Motor Show. Heavy goods vehicles were the main line and some were modified for passenger carrying.